Picture this: it’s Saturday night and you order a pizza. You tell yourself you’ll stick to two slices, but wind up eating the whole pie. The delicious cheese and pepperoni flavors far outweigh any potential self loathing you may feel later. Ten years down the road, you recall that grease-filled night and regret eating the pizza. Do you sue the pizzeria? No, of course you don’t. That’s just damn ridiculous. The only thing that could possibly be more ridiculous than my poorly constructed hypothetical pizza situation is seeing similar “logic” applied by legislators to abortion care. And yet it’s happening. Rep. Greg Heartsill has introduced a bill in Iowa that would permit women to sue their abortion providers for malpractice up to a decade after terminating a pregnancy if they regret their decision, even if they signed an informed consent form. Let’s unpack the absurdity here, shall we? First, Rep. Heartsill is perpetuating the myth that all women who seek abortion care regret doing so and are plagued by the fabricated Post-Abortion Syndrome. While it’s true that some women may regret their abortions, the solution isn’t fostering a litigious loophole, but rather bolstering mental health services and support for those who want it. Adding insult to injury is the implication that women are fickle and incapable of steadfastly making decisions, particularly ones involving our bodies. As it is, abortion providers are in short supply, thanks to a confluence of legislation leading to clinic closures, geography (the majority of providers are in metropolitan areas, leaving rural women at a disadvantage) and anti-choice violence and intimidation. Heartsill’s bill aims to further limit the number of providers — and thereby women’s access to abortion care — by threatening them with the potential for frivolous lawsuits. Or, maybe Heartsill and his minions aren’t evil legal masterminds. Maybe he just believes that abortion providers are a special breed of psychics who should know when to withhold their services, lest they get sued within the next ten years. And how many of these sign holders are going to be slammed with “hypocrite”? Let’s be realistic. 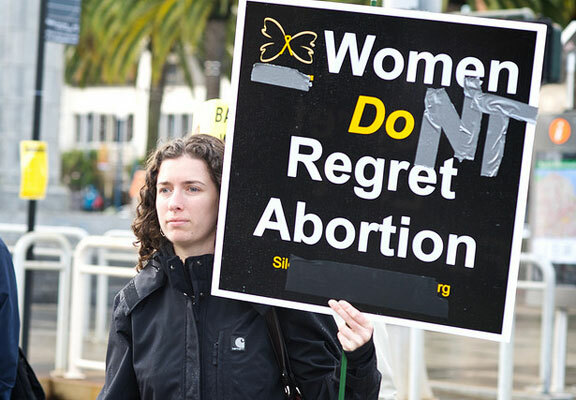 Any one who shows face to the world with “I regret my abortion” may get seriously bad reactions.